Thank you for our wonderful Cat Bib. Attached is a photo of my beautiful cat Sahara Mist Storm Raider, commonly known as STORM and what a Storm he is. The Cat Bib is great and he was absolutely fine with putting it on. He did a bit of a duck walk for a couple of days that was hilarious, then to run he was running (bouncing) like a rabbit. My friend and I cracked up laughing because the neighbours probably think I am a nutty woman that is dressing her cat up. But everyone that has seen it thinks it is an absolutely wonderful idea and my mother, who is an avid bird lover said that I should get the word out to more people in New Zealand. So certainly will be. Thanks again. My name is Faro. I am a three-year-old gray domestic shorthair. Since I was born as a stray on the streets of Las Vegas, I have always had a strong taste for birds. Don’t be fooled by my small size — I was quite a hunter! But my adopted bird-loving parents got really mad at me for my hunting skills. It got so bad that they would not let me go outside. Then, my mom and dad discovered the CatBib on the Internet. I now proudly wear my CatBib whenever I go outside. Doesn’t the purple CatBib match my gray fur? Since I have been wearing my CatBib, I have not caught one bird! Now, all the birds are happy and like to visit the yard while I watch them. Thanks for saving so many innocent lives. PS — My brother Alex also enjoys his CatBib, too! My name is Alex. I am a five-year-old orange tabby. A few years ago, I developed a taste for pigeons, sparrows, and assorted wild birds. Mmmm, they were so delicious! The trouble was — my adopted parents are avid bird lovers and they got really mad at me for hunting prey. It got so bad that they would not let me outside because I was killing one bird per day! Then, my mom and dad discovered the CatBib. I now proudly wear my CatBib whenever I go outside. Don’t you think I am the purrettiest cat in Las Vegas? Since I have had my CatBib, I have not caught one single bird! Now, the neighborhood birds are happy, my parents are happy, and best of all — I am a happy cat who loves to play in the yard. Thanks CatBib! 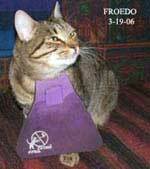 PS — My brother Faro also enjoys his CatBib, too! We were doubtful that your product would work, but we were tired of seeing our cats kill so many birds (up to 5 per week). We decided to try the CatBib. It has been more than a month and our cats (Tango and Fenster) haven�t caught a single bird. We are very pleased with the results the CatBib has given us. We would recommend this product to anyone who has a bird-killing cat. Thank you for helping us protect the birds in our area. My name is Alice and I’m wearing my “BirdBib”. At first I didn’t like it because it got in my way. Now, I am used to it and I actually play with it. However, it does not let me do the ONE thing I love to do….catch birds! 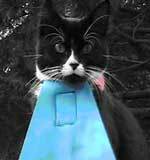 Hello Folks I want to thank you for your wonderful “Catbib” which has been a life saver for both the birds and me. I had tried everything including putting 4 bells on my cat Dusty to stop him catching the birds in my neighbours garden. He used to scale a my six foot garden fence and head straight for her garden as soon as he was let out in the mornings Who could blame him here was a virtual smorgasbord just waiting for him each day. I searched the “Net” in desperation and found your Catbib and everything has changed. Dusty no longer brings home birds and seems to be quite happy wearing his Catbib. He can still climb trees and run around the garden. Thank you for a great product. My beautiful cat, Daisy, began her unfortunate bird killing ways shortly after I fell and broke my ankle. This was a real mess as I also have a dog and a doggie door and she would bring the birds in the house, some of them still alive. I was on crutches and unable to rescue the birds and was desperate to find a way to stop this activity on Daisy’s behalf. I went online and found your site and ordered a cat bib. Since wearing the cat bib I have had no problems and Daisy is able to go in and out and enjoy her time in the yard and has not brought in any more birds. Thank you so much for this wonderful product. I am attaching a picture of her proudly wearing her bib. Our black Russian X is the fastest cat we have ever had. That goes for her bird catching abilities as well. On average, she was killing 4 natives a week that we knew of. We tried bells, mirrors on the collar. None worked. When I saw the catbib on the web, my first impression was “She’ll look ridiculous” and didn’t proceed. But after another 5 dead natives, I had to try it. First thing I noticed that Mariposa didn’t seem to mind it all. And in the past 4 months, she has caught only one bird, which is minor miracle. She still climbs trees, fences and races all around the yard. When she sleeps, she appears to sling the bib over shoulder like a cape. I have no hesitation in recommending this catbib to anyone who wants to stop their cat from killing birds. By the way, it doesn’t stop her from catching rats, which is great. 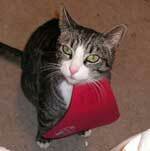 Dear Cat Goods, Here is a photo of Monty, our cat, wearing his CatBib. He is a 1 to 2 birds a day killer, but since wearing this great bib we have noticed no dead birds around our place. He is a bad wanderer and full of mischief as you can see by the dirt and hole in his bib — We could really do with a spare. This is our lovable 3 year-old queen, Taka. I was devastated when she started bringing dead birds last spring. She would put them near the front door or the door by the deck. I am a bird lover so I had put up a couple of bird feeders around the house. I put bells around her (up to 4 bells!) to no avail. I was ready to give her away but my boys won’t let me. I went to the different pet stores in Seattle. Their advice was either to not let her out the house (that drove her crazy!) or they said that it’s natural for cats to catch birds. I finally googled the web and lo and behold! I found this website selling bibs. I was skeptical at first but I was desperate. So I finally bought a blue one for Taka. You can see how lovely she looks in the picture. Since then, I haven’t seen her with a bird anymore. Thanks for CatBib! The birds and I are eternally grateful to you. Thank you for sending the CatBib to Edinburgh, Scotland which arrived within one week of ordering. Our cat, Smartie, looks really peculiar when she walks with it but this does not stop her climbing trees. We no longer receive presents of birds into the house, which means our children are not upset by feathers and dead birds when they arrive home from school. We will tell all our cat and bird-loving friends about the CatBib. Hello from Australia! Since Froedo has been wearing her CatBib we’ve had no evidence of birds or small possums (Australian natives) being caught and/or killed. We’re all extremely happy because before CatBib we were having to consider re-locating Froedo to another home that isn’t in a forest.Thank you! This is Magic. He came to our home as a kitten on Halloween 2004 and we took him in. He was a lean mean killing machine. . .at least two birds a day. Since the CatBib, he has caught one ground bird but we were able to catch and release. No others have been caught since then. I highly recommend the CatBib! This, is Sophie. There were days that she would bring home five to six dead mice and birds…we needed a way to stop her from killing them, our neighbors had complained that they kept finding dead birds in their yards. We did a search for a way to stop cats from killing birds and since Sophie started wearing her bib she hasn’t caught one bird or mouse. Thanks CatBib! Here is my cat Cinder, what upset me most was the fact that cinder did not kill the birds out right, but brought them in the house to play with (torture!) as a result, I would find an injured or dead bird, with masses of feathers all over the place. I searched the net, and found your product, the neighbours laughed at first, and said I was mean, but when I explained, it was the bib or dead or injured birds, they agreed and interested. She doesn’t mind, she’s not thrilled, but takes it as part of the routine for going outside the house, a bit like putting a lead on a dog. Mocha was found as an abandoned newborn in a North Dakota barn and grew up fearless of humans and other creatures. We adopted Mocha as a kitten, and she snagged our two boy cats’ hearts immediately, this ten pound girlcat whumping the 20 pound Jet every time they wrestle. Her tail had to be amputated. Now, two years old, extremely athletic, she has become a master bird killer, and something had to be done. Bells didn’t work. We searched the internet, found your cat bibs, and decided to try them out. Jet lost his new red cat bib and collar, so we need another one to protect the birds from him. Thank you for finding something to protect the birds from these cat hunters! Can you believe I used to call this beautiful girl Kira the Killer Kween!! I have seen her leap 4 feet into the air and catch a bird in flight! She used to be a clean and efficient killer. Since purchasing CatBib I have only seen evidence of one bird kill in my yard and I am pretty convinced it wasn’t her. She never even bothered with the ‘bib’ from the moment I put it on. Amazing. Thank you for this great invention. 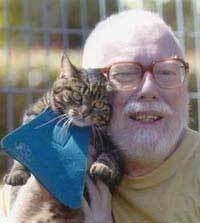 When Misty, the cat I had with me for 20 years died, it took me some time before I got another cat. I already had Dusty, who used to be a feral cat, and is now a loving house-cat, with no interest in birds. She had always been the No 2 cat with Misty around, and now she was the No 1 cat, but what was the use of being the No 1 cat if there was no No 2 cat. So eventually I started to look for a companion for Dusty. The local Animal Aid had a traumatised 6 month old female tabby, who was all curled up and barely lifted her head. So I brought her home expecting to be doing some serious rehab with her. Not so, within a few days she had bonded with Dusty, and within a week or so she had worked out how to use the cat door. And she was off – hunting birds. She even brought home a bird before breakfast once. I live in a beautiful forested area, and my neighbours in the block of units where I live all feed the birds. I tried mirrors, crystals, even an electronic high frequency zapper if she got too close to where the birds were. Nothing worked. Then I found your bib, and that was it. She was still out there hunting and stalking, but not catching anything. And she has never caught a bird since. Bonnie still loves hiding, watching, and stalking, but she knows that her catching days are over. She now spends more time playing with Dusty, which is great. Many thanks for your wonderful contribution to life on this planet. Dear Folks @ Cat Goods, Inc. Our yard is registered as a ‘Backyard Wildlife Sanctuary’ although lately I’ve been calling it Ada’s wild game park. he day I ordered a CatBib, I nearly stepped on a dead Goldfinch on the doormat as I went out to rescue a Song Sparrow from Ada’s mouth (the Song Sparrow survived). Now that she wears a CatBib our yard again resembles a sanctuary. Thank you. Hi, We recently ordered a catbib from you for our cat Cha Cha and are very pleased to report that it has worked wonderfully, to the point that the moment he went outside without it (our mistake one day) he caught a bird again ! Whenever he has it on, he does not get birds, period. He never goes outside without it any more and wearing it does not phase him. We did notice some other advantages that suprised us a lot. He has become more interested in his normal food again and is not as fussy as he was when he was catching a bird on average every day. He has also become a “sook” again and more interested in “hanging out” with us instead of spending hours away from our home trying to get birds and causing problems with our neighbours. We may not be able to take away his instinct to catch a bird however the catbib has certainly allowed us to take away the possibility of him actually catching one. Thank you very much for the bib, our old cat is now back and although his image maybe shattered and the neighbours may laugh at his new attire, it is certainly better than hearing diplomatically through our neighbours that Cha Cha has left a pile of feathers in someone elses yard ! Thank you so much for this wonderful product. Purna may look innocent in this photo, but she was on the one-a-day prescription pre-bib. It was horrible. She’s had a few encounters with injured birds post-bib, but overall not too bad at all. And, it almost seems as if she enjoys the bib – it makes her feel special. She waits at the cat door for me to put it on in the morning. Amazing product! I am enclosing a picture of Oscar, wearing his cat bib. My husband was very skeptical but it has worked very well. No more beautiful dead birds on the porch. My neighbors all ask me what Oscar is wearing, they think it’s a bib. I also wanted to add that last year Oscar lost his collar and cat bib. I searched the front and back yard but could not find it. Then several months later, there it was by the bird feeder. My theory is, that all the woodland creatures brought it in the yard for me to see. What other explanation could there be? ?